The variety of melons in this recipe makes for bright, colorful fruit pops. These colorful popsicles look so cheerful! At least, they did . . . until they started melting into puddles during my photo shoot. Eight fruit pops were harmed during the production of this blog post. 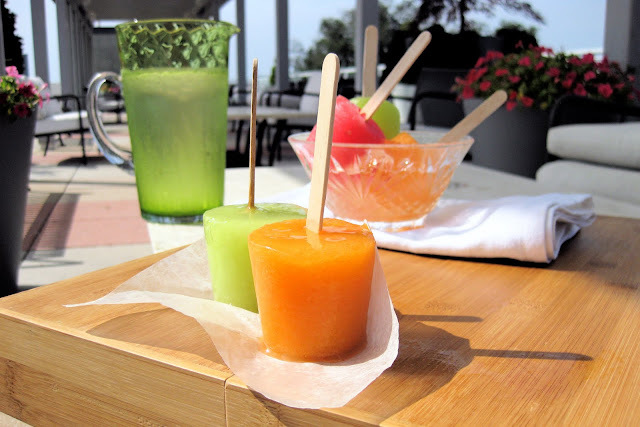 Watermelon, cantaloupe, honeydew melon, and a hint of citrus -- that's all it takes to whip up a batch of cool and colorful frozen treats for the afternoon. This melon popsicle recipe is so easy and so quick to make -- a great recipe for kids to try. For the cantaloupe and watermelon, I used lemon juice and threw in a little zest, too - so refreshing! I did the same with lime for the honeydew pops. My personal fave? The cantaloupe pops. They had a smoother texture than the other two melon ice pops. These healthy popsicles are easy to make and use 100% fruit. These fruit popsicles appeal to a wide range of specialty eating needs. There's no added sugar, which makes for a very healthy popsicle. And, because they are made from 100% fruit, they count as vegan popsicles and paleo popsicles. They are versatile, too: you can use any kind of melon. They key for good melon popsicles is that the melon be very ripe, and that you process it into an extremely smooth puree. 1. Process melon and citrus juice in blender or food processor until completely smooth. 3. If you are using Dixie cups, freeze until slushy and somewhat thick, then stick popsicle sticks in and continue to freeze until solid. 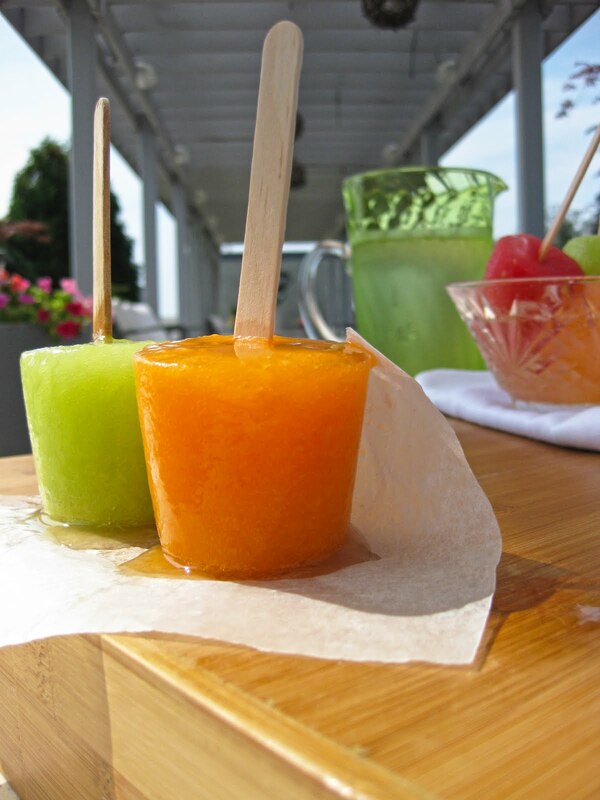 The quantity of melon ice pops this makes depends on the size of the fruit and the size of the molds you are using. Dixie cups are great for this project because you're not going to run out. The honeydew melon made about 24 3oz servings, the cantaloupe made about 12 3oz servings, and the watermelon made so many servings it would have been ridiculous to count them. You can add sweetener if your fruit isn't ripe (up to 1/2 cup granulated sugar or equivalent sweetener per melon should be plenty). I found that sugar was overkill for already ripe fruit, so you might as well keep it healthy. Summer isn't over yet (at least not here! ), so enjoy the last of it while you still can and try making some of these delicious melon popsicles! Thanks so much for sharing this on Chowstalker! I used your recipe and tips to make melon pops. They were GREAT and healthy! I used lime juice for the honeydew and a little lemon zest with the lemon juice for the cantaloupe. I also added a little salt for the cantaloupe. If you use ripe and ready fruit you don't need sugar. If your melon isn't flavorful I don't think a bunch of sugar will rescue it. In Colorado we've had a bumper crop of wonderful melons. This recipe was a great way to use the melon while it's cheap and save some for later. One recipe I saw used powdered sugar to sweeten. In one batch I added 1/4 cup. It mixed easily but I didn't think it was necessary in my other batches. I used the plastic forms that make 4 pops. One batch (smallish honey dew size) made 10 pops. These were half off at my favorite store. (AND they slid right out with a warm water 'dip'.) Thanks for the recipe! I have wanted to do this for a while, but it didn't make sense to add as much sugar as most recipes called for. Some recipes even called for simple syrup - it doesn't need to be that difficult!! This was super simple in my food processor!